Have a holly, jolly, and oh-so-safe holiday season. Often in our festive rush, we overlook our companions and their needs. Holiday guests can be stressing for our pets and us. Open doors, yelling children, grabbing hands, food and alcohol left around, and holiday cheers can be a lot for our companions to handle. Sometimes we forget about the little things during the hustle and bustle of the holiday season. It’s important to remember to keep your companion safe so they can enjoy the celebrations too. Be sure not to leave lit candles unattended, place them on a stable surface in proper holders to prevent your pets from burning themselves or causing a fire. Keep wires, batteries, and glass or plastic ornaments out of paws' reach. A wire can deliver a potentially lethal electrical shock and a punctured battery can cause burns to the mouth and throat, while shards of breakable ornaments can damage your pet's mouth and paws. While we may love putting up all sorts of decorations, caution needs to be taken. Tinsel, garland, glass ornaments, fake snow, light strands, holiday plants, and ribbons on packages can cause major problems if eaten or chewed. Monitor your companions closely if they must be in the general vicinity of such items. Kitties love the sparkly, light-catching tinsel "toy" that's easy to bat around and carry in their mouths. But a nibble can lead to a swallow, which can lead to an obstructed digestive tract, severe vomiting, dehydration, and possible surgery. It's best to brighten your boughs with something other than tinsel. Also, strings of thrown confetti can get lodged in intestines, if ingested, perhaps necessitating surgery. Many holiday plants can be poisonous, cause irritation, and, sometimes, far worse. Poinsettias could cause irritation of the mouth, but are not considered deadly. Mistletoe can cause gastrointestinal upset and cardiovascular problems. Holly can cause nausea, vomiting, and diarrhea. Many types of lilies can cause kidney failure when ingested. There are a few things you can do to include holiday plants, opt for just-as-jolly artificial plants or order a pet safe bouquet from your local florist. When we think of the holidays a big decorated tree comes to mind. While it is rare for pets to consume large amounts of tree material, it is important to keep an eye on the tree when they are around. If you are having guests and cannot supervise, confine your companions away from hazards. Fir tree oils can be irritating to the mouth and stomach causing excessive drooling or vomiting. The tree needles are not easily digested either; they can cause gastrointestinal irritation, vomiting, gastrointestinal obstruction, or puncture. Securely anchor your Christmas tree so it doesn't tip and fall, causing possible injury to your pet or guests. This will also prevent the tree water—which may contain fertilizers that cause stomach upset—from spilling. Prevent your pet from drinking the stagnant water in your tree stands. Additives and the bacteria, which grow in the water, could poison your pet. An alternative to a live tree would be to get an artificial one. 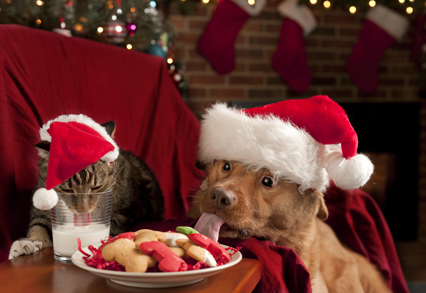 Holiday treats come around once a year and although we may love them, many foods can be very harmful to our pets. Remember, our furry companions will go to great lengths for a tasty morsel. Make sure to keep your pets away from the table and unattended plates of food, and secure lids on garbage cans. Bones stolen from plates or the trash could cause major problems if eaten. If your pet is out during the holiday gatherings keep an eye on your guests and what they are sneaking under the table! Pets can join the festivities in other fun ways that won't lead to costly medical bills and health hazards. It is a tradition to leave out milk and cookies for Santa Claus. When everyone wakes up and everything has been eaten the magic of the holiday season truly comes alive. Be sure it is Santa consuming the milk and cookies and not your companion. Keep pets secure in a different room when food is left unattended. Or, leave pet cookies and water out, Santa is sure to have some hungry reindeer. We may love having guests over for the holidays, but some of our companions do not like, or do well in, social situations. Increased stress and anxiety during the socially active and chaotic times of the season may heighten your pet's chance at escape. Make certain your pets are fitted with the proper tags or microchipped to ensure a speedy return home if such unforeseen circumstances were to come about. Watch your pets closely and be aware of their behavior. While we see our visitors as guests, sometimes our companions see them as intruders, attackers, etc. Give your pet a “guest free” area that is secure and quiet for them to escape to and feel safe. As you count down to the New Year, please keep your companions in mind. Noisy poppers and fireworks can terrify pets and cause possible damage to sensitive ears. Pets should be confined to a quiet area during loud celebrations, that way the entire family can enjoy the holidays. First and foremost it is imperative that pet owners always check with those they intend to visit to ensure their pets are welcome. If there will be pet guests coming to your home, it is highly advised that all pets have been introduced prior to the holidays in a neutral location. If your companion will be traveling along with you, do not forget copies of vaccine records, food, crate, bedding, and any medications. It is important to remember that bringing your pet to a strange, new home may produce intense feelings of stress and anxiety. Be very aware of your pet's mood and behavior. If they begin to show signs of uneasiness or timidity, then remove them from the situation immediately, regardless of what activities you’re involved in. It is a lot of work to cater to human guests; the addition of extra pets could be asking too much, especially if your companion isn’t people friendly or well behaved. If you don’t want to leave your pet home for the holidays, boarding is a great option. Delavan Lakes Veterinary Clinic (DLVC) has a large boarding facility that accommodates all dog and cat breeds in separate areas! You won’t have to feel guilty leaving your companions behind with DLVC, as extra care and attention is given to every pet. Cleanliness is a priority and ensures a safe and healthy stay with us. We are also equipped to board most exotic pets with advance notice. The cold, wet winter weather can pose serious health risks to your companion. Whenever possible keep pets indoors during the winter months. Outdoor pets should be cared for properly and provided adequate shelter with extra precautions in place for the harsh elements. Rock salt is commonly used during the wintry months of the holiday season. It is rough on your pet's paws and skin, and can lead to a severe, painful drying out and cracking of the skin and paw pads. Avoid exposing your pet to rock salt whenever possible. And be sure to clean your pet's feet and fur thoroughly after coming inside. Taking the necessary precautions during the holidays will help to ensure that you and your pet will enjoy the beauties and wonders of the season. The safety and happiness of everyone involved will aid in making this time of year far more enjoyable for everyone. Check with your veterinarian for any further actions you can take to ensure that your companions are able to spend a healthy holiday season together with the family.